Mill-Max's 0967 is a low profile, horizontal, surface mount spring pin designed for edge board interface applications: board-to-board or device-to-board. Whereas most spring pins are designed to mount vertically on a pc board, the 0967 mounts parallel to the pc board so that the plunger travel is horizontal to the board surface. The above board height of .100" (2,54 mm) provides a low profile for tight packaging requirements. 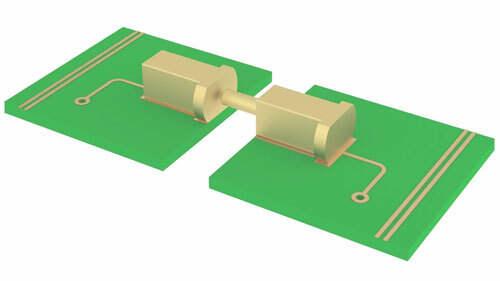 Typically mounted on the edge of the pc board, it can be mated with a board running perpendicular to it, or parallel pc boards can be daisy-chained together by using the Mill-Max 7937 horizontal SMT target pin and 0967 on opposing boards. The 7937 provides an area approximately .100" (2,54 mm) high by .155" (3,94 mm) long for the plunger of the 0967 to mate with – more than ample to ensure a highly reliable interconnect.